Scientific American / Farrar, Straus and Giro, 9780374248192, 352pp. Stretching 1,400 miles along the Australian coast and visible from space, the Great Barrier Reef is home to three thousand individual reefs, more than nine hundred islands, and thousands of marine species, and has alternately been viewed as a deadly maze, an economic bounty, a scientific frontier, and a precarious World Heritage site. Now the historian and explorer Iain McCalman takes us on a new adventure into the reef to reveal how our shifting perceptions of the natural world have shaped this extraordinary seascape. Showcasing the lives of twenty individuals spanning more than two centuries, The Reef highlights our profound desire to conquer, understand, embrace, and ultimately save the world's most complex ocean ecosystem. Opening with the story of Captain James Cook, who sailed unknowingly into the southwest entrance of this vast network of coral outcroppings, McCalman shows how Cook spent months navigating this treacherous underwater labyrinth, struggling to keep his crew alive and his ship afloat, sparring with deceptive shoals and wary native islanders. Through a series of dramatic tales from intrepid explorers, unwitting castaways, inquisitive naturalists, enchanted artists, and impassioned environmentalists who have collectively shaped our ideas about the Great Barrier Reef, McCalman demonstrates how this grand natural wonder of the world was built as much by human imagination as by the industrious, beautiful creatures of the sea. 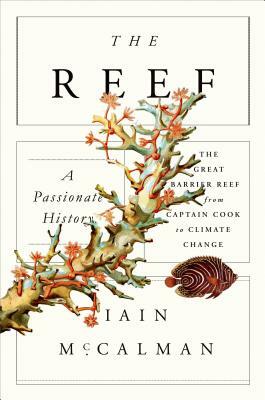 A romantic, historically significant book and a deeply personal journey into the heart of a marine environment in peril, The Reef powerfully captures the delicate relationship between humanity and the natural world. Iain McCalman is a fellow of the Royal Historical Society, a historian, a social scientist, and an explorer. He is the author of the award-winning Darwin's Armada, The Seven Ordeals of Count Cagliostro, and Radical Underworld. A professor of history at the University of Sydney, he has served as the president of the Australian Academy of the Humanities and the director of the Humanities Research Centre at the Australian National University. McCalman has also been a historical consultant and narrator for documentaries on the BBC and ABC, and has been interviewed by Salon and the World Science Festival.